Structural Steel Detailing and Steel Detailers – Are they Really Effective? Accuracy is the key for success of any work same is in structural steel detailing. Smaller error also costs more in terms of both time and money. Process of structural steel detailing is one of the vital process for construction activities and manufacturing activities. Steel detailers are responsible for delivering precise structural steel detailing. The other key personals involved in steel detailing process are architects, engineers, steel fabricators, contractors etc. and all are responsible for high level accuracy. Some times work done by independent steel detailers but preferred is best structural steel detailing services provider. What Involved in Structural Steel Detailing? Erection drawings are used to provide information about dimensioned plans and specifies the geographic location of each of the steel component within the structure. Position of each components, installation requirements, and all other work like welding spots, wedge anchors, bolt installation etc. associated with the project is described in the erection drawings. Every detail about steel piece like joints, columns, braces etc. are described by the drawing named shop drawings. Shop drawings describes how steel fabricators should made every component. It includes all dimensions and sizes, bolting, welding, material specifications and other vital information of components in it. 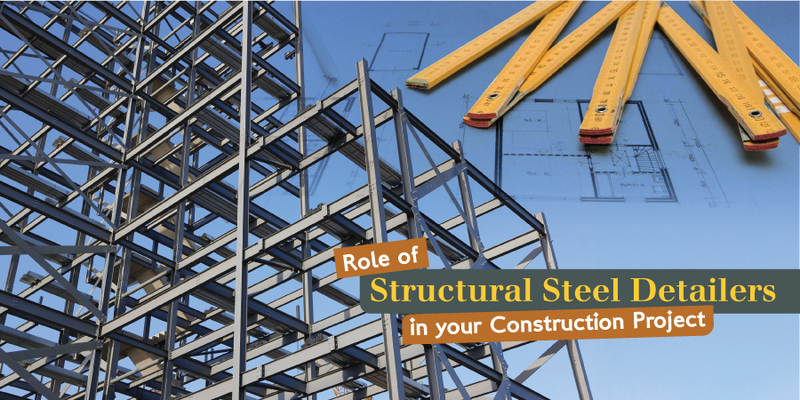 Significance of Structural Steel Detailing. Natural calamities like earthquake, storm, fire causes building to collapse if structure is not constructed with the high level of accuracy. Both large structures and a small structure need high preciseness but large structures require extra caution and to avoid this kind of risk structural steel detailing is important. This a reason why architects rely on skill of steel detailers as they crate dependency with their in-depth skills, drawing blueprints and sitemaps. However, joists and large icon beams are also cared enough and placed perfectly to reinforce the building. Just don’t give all attention to the detailed reports, column positioning, and fabrication details. It is easy for small structures but not much easy for large residential or commercial structures and this is a reason why need of professional steel fabricators arise. These professionals help to get quality steel detailing, reduce hazards, save money and absolutely more reliable to take responsibility of build high quality structures. Outsourced steel detailers that knows joint connection very well can reduce structural model into the detailed orthographic views used for building permits, contractor bidding, and also for client review and approval. In simple ways third-party steel detailers free inhouse detailers and take steel framing to design layout and ensure a consistent annotation of all steel members. Most effective way to save money is detailed and highly accurate shop drawings. to correctly apply the dimensions and symbology for the right welds, cut lengths, and hole drilling patterns shop drawing or steel fabricators need expert steel detailers along with the structure drafting providers so that it leaves the machine shop free to fulfill the steel fabrication order. What looks good on paper may not work in reality this is what welders and fitters realize so the construction rework is always present in structural project. The process of field rework and the legal requirement for finalized as-built construction documentation is a task that is easily accomplished by structural detailers. There are several related drawings and one change affect the many of them. Structural steel detailer can assure your final projects are of high-quality and accuracy. Structural steel detailing is a critical task performed by the proficient steel detailers that strengthen the building structure. Tekla, SolidWorks etc. are the common software for steel detailing used by the structural steel detailing company to deliver the precise results in structural engineering services. Building Contractors, Structural Consultants, Fabricators, Steel Detailers, Rebar Detailers, Architects, and Structural Consultants etc. are used to utilize outsourced structural steel detailing and steel detailers as they found it really effective in reducing time and cost.